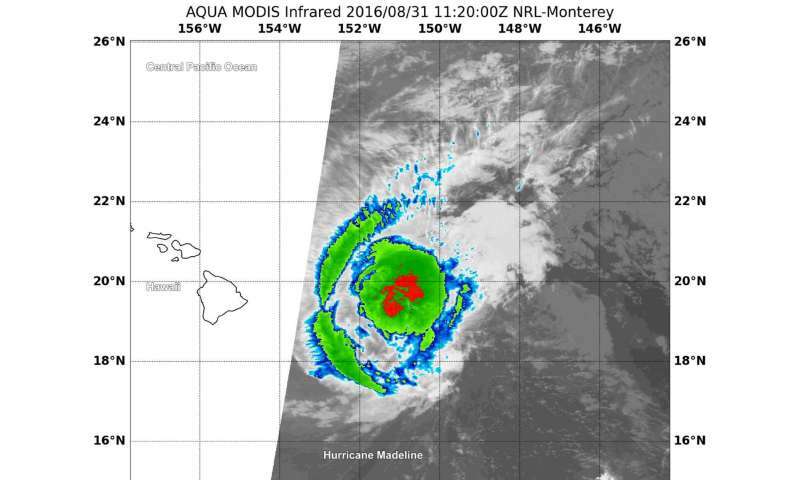 Hurricane Madeline was a powerful Category 4 storm that has now weakened to a Category 1 storm as it nears the Big Island of Hawaii. NOAA's GOES-East satellite has been continuously capturing imagery of the storm that showed the structure has been weakening. Two NASA satellites confirmed that the storm was weakening. Visible and infrared imagery from NOAA's GOES-West satellite was compiled and made into an animation showing the progression and strengthening then weakening of Madeline between Aug. 29 and 31. The animation was created at the NASA/NOAA GOES Project at the NASA Goddard Space Flight Center in Greenbelt, Maryland. At 7:20 a.m. EDT (1120 UTC) Infrared data from the Moderate Resolution Imaging Spectroradiometer aboard NASA's Aqua satellite showed cloud tops northeast of the center as cold as minus 70 degrees Fahrenheit (minus 56.6 degrees Celsius). Cold cloud tops indicate the area of strongest storms that stretch highest into the troposphere. The higher they are, the colder the air temperature. At 11 a.m. EDT (1500 UTC) on Aug. 31, Forecaster Birchard of NOAA's Central Pacific Hurricane Center (CPHC) noted "After a period of rapid intensification that ended early Tuesday (Aug. 30), Madeline has been rapidly weakening since Tuesday afternoon, primarily due to increased vertical wind shear. Latest satellite images show that the cyclone's structure has degraded significantly, with the center estimated to be on the southwest side of the cold cloud tops." In imagery from NASA-NOAA's Suomi NPP satellite taken at 7:29 a.m. EDT (1129 UTC) there was an indication that the low-level center of Madeline was becoming partially exposed to outside winds, and when NASA-JAXA's Global Precipitation Measurement mission or GPM core satellite passed overhead around the same time, GPM data confirmed the exposed center. At 2 p.m. EDT (8 a.m. HST), NOAA's CPHC noted that a Hurricane Warning is in effect for Hawaii County, and a Tropical Storm Warning is in effect for Maui County including the islands of Maui, Molokai, Lanai and Kahoolawe. 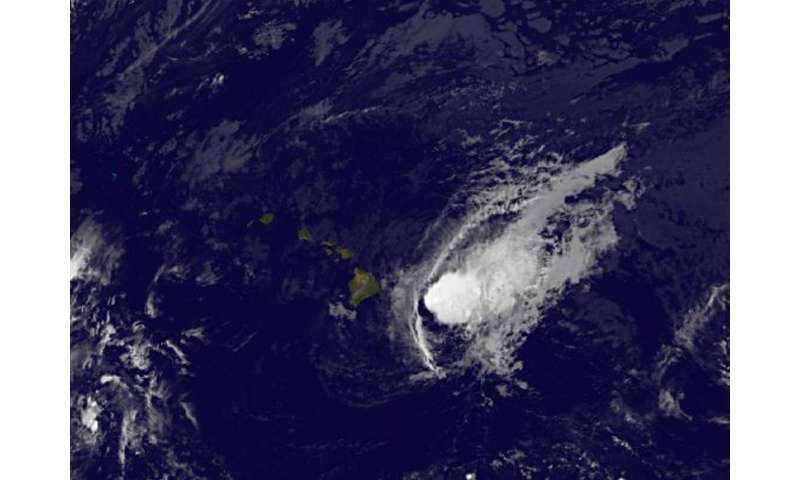 At that time the center of Hurricane Madeline was located near 18.7 degrees north latitude and 153.6 degrees west longitude. That's about 120 miles (195 km) east-southeast of Hilo, Hawaii. Madeline is moving toward the west near 12 mph (19 kph) and this general motion is expected to continue for the next couple of days. Maximum sustained winds are near 75 mph (120 kph) with higher gusts. Steady weakening is forecast during the next 48 hours, and Madeline is forecast to weaken to a tropical storm later today or tonight. The estimated minimum central pressure is 990 millibars. Hurricane conditions are expected to develop over portions of Hawaii County later today and continue into early Thursday. Tropical storm conditions are expected to develop over Maui County later today and tonight, especially over mountains and where winds blow downslope from higher terrain. Hawaiian waters today, possibly becoming damaging along east facing shores of Hawaii County and eastern portions of the Island of Maui today and tonight. Madeline is expected to produce total rain accumulations of 5 to 10 inches, with isolated maximum amounts near 15 inches, across Hawaii County, especially over windward portions. Total rainfall accumulations of 1 to 3 inches, with isolated maximum amounts up to 4 inches, can be expected in the islands of Maui County. This rainfall may lead to dangerous flash floods and mudslides. Depending on the track of Madeline, the combination of storm surge and tides could cause normally dry areas near the coast to become flooded. The water could reach 1 to 3 feet above ground if peak surge were to coincide with high tide. The surge would be accompanied by large damaging surf and can vary over short distances.